This Access Point connects a wireless network to an existing Ethernet network. It is connected to the fixed network, and controls the connections from there. It is also possible to have roaming facility through the use of more Access Points. This Access Point connects a wireless network to an existing Ethernet network. It is connected to the fixed network, and controls the connections from there. 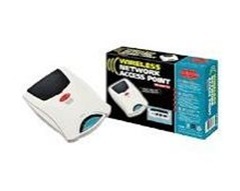 It is also possible to have roaming facility through the use of more Access Points.